A new study by Neil Carter, a University of Maryland research associate and postdoctoral fellow at the National Socio-Environmental Synthesis Center (SESYNC) at UMD, shows that we can better understand how nature and humans are interlinked by comparing apples to oranges. Or, more accurately, tigers to pandas. 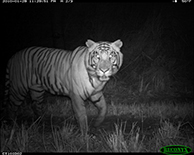 The study, published in Ecology and Society, compares Chitwan National Park in Nepal, which shelters approximately 125 wild endangered Bengal tigers, and Wolong Nature Reserve in southwestern China, home to an estimated 154 wild endangered giant pandas to reveal that useful conservation insights can be found in unlikely places. The authors show that applying the same methodology to these vastly different environs can uncover shared patterns and common insights. "For people interested in wildlife research and conservation, there's an increasing awareness of the need to go beyond biology and ecology, and to incorporate insights from various other disciplines, like social psychology and economics," said Carter. "We know it's important, and now we're saying, 'here's a good way to do it.' The idea is: you can use a common framework to understand the fundamental ways people and wildlife interact, despite the differences in social and economic settings." On the surface, pandas and tigers seem to have different impacts. Pandas eat bamboo. Tigers sometimes eat livestock, and, rarely, even eat people. Although both located in Asia, Chitwan and Wolong are also characterized by important differences in biophysical environment: for example, the topography in Wolong is more rugged, while Chitwan lies at relatively low elevations. In spite of these differences, both biodiversity hotspots share deep, complex links with the humans that depend upon their rich but finite natural resources. Approximately 5,000 residents live within Wolong, and conservation policies represent a constant struggle to balance residents' need to secure a livelihood with the pandas' full reliance on vast access to bamboo. Chitwan has no residents, but the people living adjacent to its borders venture inside to harvest its resources. The park borders are porous both ways: tigers can venture out to attack livestock and can also pose a threat to the people who walk through the woods. Economic costs of living near wildlife are likewise widespread. Those closest to panda and tiger habitat, in particular, have incurred high costs from conservation efforts, including restrictions on certain agricultural activities, fuelwood collection, timber harvesting, and hunting. Both animals bring advantages, too—which range from the tangible, like attracting tourists, to matters of the spiritual and national pride. "People and wildlife are tightly coupled human and natural systems," said Jianguo "Jack" Liu, Rachel Carson Chair in Sustainability at Michigan State University and co-author of the study. "Over many years, interdisciplinary studies on pandas, tigers, and the people who live amongst them are revealing some universal truths about conservation around the globe." At the core of the study's framework is an understanding of how conservation efforts directly affect wildlife and people, because impacts on local residents can in turn significantly affect wildlife. The authors note that how policy is executed, how people living in and around the reserves behave, and common telecoupling processes—e.g., socioeconomic and environmental interactions over distances, such as tourism and migration—all loom large across many diverse flagship nature reserves. Giving scientists a framework to compare these similar dynamics leads to broad insights about human–wildlife interactions that can facilitate knowledge exchange and inform wildlife conservation policies across and between locations. "Much of what we learn from one site trickles to other sites," Carter said. "For instance, we've seen that how much responsibility local people have to monitor and manage a forest track is significant. Nepal took the lead in experimenting with ways to have people manage their forest. Now that's being tried in other places. You won't get one answer. You get different points of view—and that's important." In addition to Carter and Liu, the paper's co-authors include Andrés Viña, assistant professor at Michigan State University; Vanessa Hull, doctoral student at Michigan State University; William McConnell, associate professor at Michigan State University; William Axinn, professor at University of Michigan; and Dirgha Ghimire, associate professor at University of Michigan.